Several buildings in East Harlem have bustling storefronts, yet the residential units above are empty, some for decades. East Harlem has been undergoing a resurgence for two decades, yet the neighborhood is still pockmarked with four- or five-story walk-ups where the ground-floor stores are bustling and the apartments above are devoid of life. Their windows are boarded up, blocked up or just drearily empty, torn curtains testifying to no one’s having lived there for years. Follow@NYTMetro for New York breaking news and headlines. The exterior of a building on Third Avenue in East Harlem. Although the vacancy rate in Manhattan hovers at 1 percent, at least some of the landlords of these sealed-up buildings — hundreds of them exist in pockets across the city — are deliberately keeping their buildings mostly vacant, content to earn income from first-floor commercial tenants rather than deal with the trouble and expense of residential tenants. In some cases, city housing officials say, landlords are waiting for a revived economy to raise rents so that it makes financial sense to repair plumbing and electrical wiring. In other cases, landlords are “warehousing” apartments for the moment that a deep-pocketed developer comes along, as has happened in the blocks just north of 96th Street, East Harlem’s southern boundary. In still other cases, it is simply mystifying that apartments would be left vacant for decades, particularly since East Harlem has been a magnet for Mexican and other Latino immigrants, as well as young strivers looking for cheap space. At Dr. Mark’s Optical Center, on the corner of 108th Street and Third Avenue, the store’s manager said the apartments above the shop, perhaps a dozen in total, had been empty for 30 years. Merchants in other buildings said the apartments above their stores had been empty for 20 years. “Considering the fact that we went through a housing boom and those buildings still remained vacant, I don’t know what is their intent,” said Melissa Mark-Viverito, the city councilwoman who represents East Harlem, referring to building owners. Warren A. James, a local architect, has been studying East Harlem’s vacant buildings and has counted 40 of them within a short walk of his office on 112th Street, many owned for decades by the same family. He points out that these buildings are close to the northern end of Central Park, the No. 6 subway line and the Upper East Side, and could draw reasonable rents. Some two-bedrooms in the area already command more than $3,000 a month. Ms. Mark-Viverito and other housing advocates, having christened these vacant buildings “haunted houses,” are planning a march on Monday to spotlight the blight and desolation such buildings foster. They want to press officials to find ways of encouraging landlords to offer more low- and moderate-income housing. The phenomenon has been borne out by several studies. In 2007, the Manhattan borough president, Scott Stringer, released a survey of Manhattan’s buildings that found 1,723 were significantly vacant, with three-fourths of that total located north of 96th Street. A 1998 survey by the nonprofit group Civitas, which is concerned with development on the East Side, found that one of four low-rise residential buildings on avenues or major cross streets in East Harlem had open stores but had sealed up the residential floors, leaving many avenues forlorn at night. “It deprives the blocks of a certain vitality, and it doesn’t take advantage of the opportunities of converting those structures to residential use,” said Hunter Armstrong, Civitas’s executive director. Civitas attributed the emptiness partly to the allure between the 1940s and 1970s of public housing projects, which emptied many tenements and left landlords with weathered properties that were too expensive to repair for the low rents they might yield. In many cases, the buildings stand out because they have been draped with scaffolding to prevent crumbling facades from hurting passers-by. Store owners in some buildings said the scaffolding had been up for years, keeping customers away. City officials have met with some landlords, like the real estate firm known as Ross & Ross that owns many empty buildings under several corporate names. RuthAnne Visnauskas, the deputy commissioner for development at the city’s Department of Housing Preservation and Development, urged members of the Ross family to consider loan programs offering incentives for rehabilitation. Family members said they would “take it under consideration and come back to us,” but never did, Ms. Visnauskas said. Simon Rosenfeld, president of one of the Ross family’s companies, declined to comment when reached by telephone. 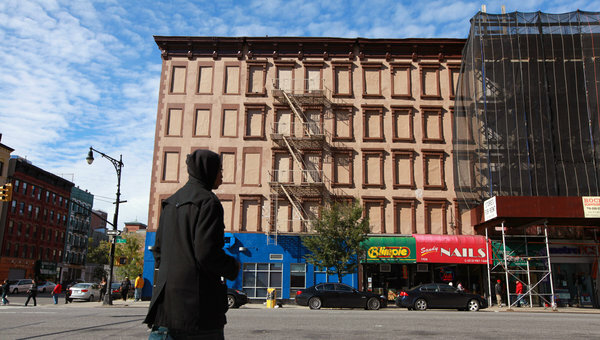 Mr. James, the architect, took a reporter on a walk between 106th and 116th Streets and between Lexington and Third Avenues and pointed out 20 boarded-up residential buildings with active storefronts. At 152 East 110th Street, a four-story building was abandoned except for a Dolce Vita pizzeria. A five-story corner building at 1773 Lexington Avenue had a busy grocery and a shuttered restaurant, but the apartments above had long been vacant. The two buildings to the south had Chinese and Mexican restaurants and a nail salon, but the apartments above were also empty. “My best guess is they don’t want the hassle of renting to tenants,” he said, pointing out that tenants protected by rent-stabilization laws could be difficult to evict. At the corner of 106th Street and Third Avenue, the boarded-up windows and the remainder of the four-story building have been sleekly painted a rich taupe, allowing the Chase Bank branch below to escape looking as if it were in a forsaken slum. Still, no one lives in the apartments. At 1987 Third Avenue, near 109th Street, the owner of a 99-cent store, Gohar Ali Khan, said the apartments above him had been vacant all 13 years he had been there. “If they make it a rent building or sell it for millions of dollars, which one you think is better?” he said wryly. Mr. James pointed out the contrast between the boarded-up five-story building at 2037 Third Avenue and a similar building next door that had been power-washed and given new windows, demonstrating that an improved building could be fully occupied. A few blocks up the avenue, a Duane Reade was the only flourishing feature on a desolate row of four boarded-up apartment houses. At 1697 Lexington Avenue, three stories of vacant apartments were hidden from view behind a screen of scaffolding, which Mr. James said had been there since he moved to 112th Street 12 years ago. That building is owned by Lenmort Realty Corporation, a Ross & Ross company, according to city finance records. Across the street, brownstones have sold for more than $2 million. “I have people I know that have made offers to buy them, but they won’t entertain any offers,” Mr. James said of the Ross family. The beauty salon on the building’s ground floor closed down six months ago, but a sign announces that the space is for rent. There is no such sign for the apartments above. Spartans, what is your profession? Richard Branson: learning from failure. ZeekRewards - Die Rewards Program of a Lifetime!